It is not easy to be a woman hockey player in Bozeman Montana. With one ice rink, our ice time is very limited and there are not enough skaters to have local teams to play against. Therefore, we travel to other cities around the area to find people to play. And when I say we travel, we really have to travel! Four years ago, we began putting a calendar together to raise money to make our traveling costs more feasible so we can continue to play together. In addition to assisting with traveling costs, we are also raising money to assist the Gallatin Ice Foundation in their efforts to build a second sheet of ice in Bozeman. Please buy a 2013 Bozeman Weasels women's hockey calendar and help support Bozeman Women's Hockey! The 2013 Bozeman Weasels Women's Hockey calendar features local woman players in hockey "lingerie." - Help support their Women's Hockey Teams as the proceeds will benefit women's hockey and the Gallatin Ice Foundation in their efforts to build a second sheet of ice. These "11 x 17" 2013 hockey calendars are easy to order and help a great cause! They are collectible and a great gift for any adult hockey player or simply for yourself. 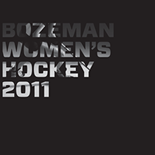 2012 Bozeman, MT Women's Hockey Calendars are available at long as supplies last! Shipping Info: 2013 Bozeman Women's Hockey Fundraising Calendars ship via USPS in Thick Envelopes to protect the calendars. Shipping Info: 2013 Bozeman Women's Hockey Fundraising Calendars ship via UPS in Thick Envelopes to protect the calendars.